Michael has enjoyed a parallel career as a writer. He was a contributing writer to MODERN DRUMMER magazine for twenty-five years (1983-2008) and has written over 200 articles for such magazines as DownBeat, AVANT, RHYTHM, and many others. Among his books are, WHEN IN DOUBT, ROLL! (with Bill Bruford), PERCUSSION PROFILES (with Trevor Taylor), and THE THINKING DRUMMER series of instruction books. 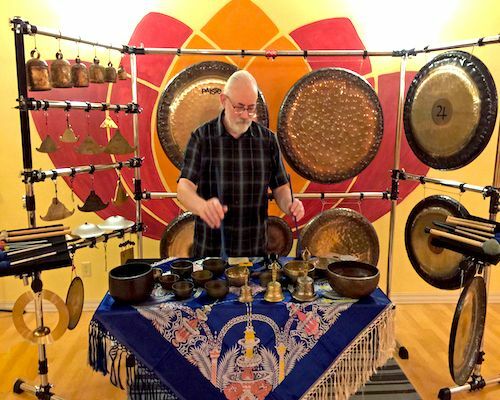 His long running blogs: The Way of the Gong™, Art As A Spiritual Practice, and, Percussion Deconstruction™, have been embraced by both the meditation/sound therapy, and percussion communities. Along with performing, he has taught privately, as well as presenting workshops at schools and universities across the country. He believes teaching and sharing his knowledge is an important part of being a working musician. Besides his solo performing with GONGTOPIA, he is one half of the GONGTOPIA TAIRAKU Duo with shakuhachi player Brian Ritchie (bassist for Violent Femmes). He has presented workshops on Gongs at the prestigious Percussive Arts Society International Convention (PASIC) in 2005 & 2012; and was the Artist in Residence at the 2016 MONA FOMA Festival in Hobart, Australia, where he presented 8 concerts featuring gongs and metal percussion. Michael endorses Paiste cymbals/sounds/gongs, Mike Balter mallets, and Orpheus Percussion products.